Globetrotters Bed and Breakfast is located minutes from the historic Old Town of Niagara-on-the-Lake, and its Shaw Festival theatres, boutiques, restaurants, wineries and cycling paths. The historic Welland Canal and the world-famous Niagara Falls are just a 25-minute drive away. We're happy to offer our guests complimentary wine-tasting coupons to the many award-winning wineries located throughout Niagara-on-the-Lake. Enjoy a beautiful 25-minute drive along the gorgeous Niagara Parkway to view the world-famous Niagara Falls. Book your Niagara-on-the-Lake bed and breakfast accommodation directly with us for the best online rates. 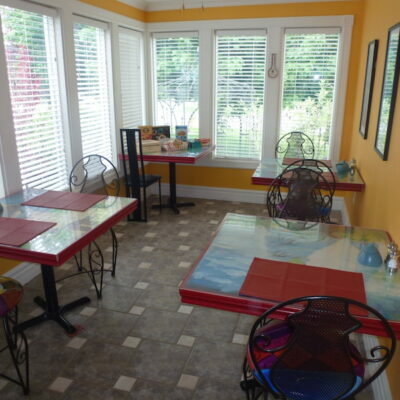 Tables in our sunny breakfast room can be moved to accommodate up to 10 guests who wish to enjoy breakfast together at Globetrotters B&B/Gallery in Niagara-on-the-Lake. Globetrotters Bed & Breakfast in Niagara-on-the-Lake. The front garden at Globetrotters B&B/Gallery in Niagara-on-the-Lake. The private place for Crystal Palace guests at Globetrotters B&B/Gallery in Niagara-on-the-Lake. A glimpse into our backyard garden from the front yard. The perfect place to enjoy a good book and a glass of wine. A shady nook in the garden. A view of our covered veranda from the garden. Enjoy a good book, a glass of wine and good conversation on our covered veranda. Weather permitting, delicious breakfasts are served under our covered gazebo in our private garden. A sleek, new vanity for Le Moulin Rouge ensuite. A roomy, walk-in shower for Le Moulin Rouge ensuite. Entrance to the Crystal Palace room on the main floor at Globetrotters B&B/Gallery in Niagara-on-the-Lake. A queen size bed, closet, side table and full-length mirror in the Crystal Palace guest room at Globetrotters B&B/Gallery in Niagara-on-the-Lake. A queen size bed and original headboard by Jane Hall in the Crystal Palace at Globetrotters B&B/Gallery in Niagara-on-the-Lake. A boudoir chair by Jane Hall in the Crystal Palace guest room at Globetrotters B&B/Gallery in Niagara-on-the-Lake. Check what's happening in Niagara-on-the-Lake anytime here.